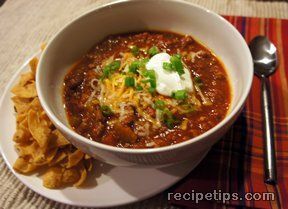 Here is an outstanding chili recipe that makes a terrific meatless meal. Garnish with shredded cheese and chopped onion, if desired. 1. Heat oil in large saucepan on medium-high heat. Add onion and green bell pepper; cook and stir 5 minutes. 2. Stir in beans, tomatoes and remaining ingredients. Bring to boil. Reduce heat to low; simmer 20 minutes, stirring occasionally.